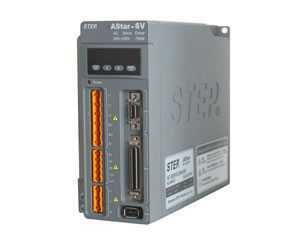 AS210 servo drive refers to a controller for servo motor. It has the same function to a servo motor as that an AC drive to an AC motor. Our servo drive is equipped with dual DSP chipsets to ensure high frequency response. The dual-DSP also allows the servo drive to achieve complicated control algorithm and enables it to be digitalized, networked and intelligentized. Through parameter setting, the servo drive is able to achieve flexible control modes, such as torque control, speed control, position control and integral control modes. The power devices of the servo drive are designed with a drive circuit using IPM. Inside the IPM there is integrated circuit and meanwhile, there is over voltage, over current, over heat, and under voltage detection functions to protect the circuit. The major loop of power devices comes with a soft start circuit to reduce the impact on the servo drive during starting process. The power drive unit of the servo drive is designed with three phase full bridge rectifier to convert three phase AC or mains supply into DC. Then, the three phase sine wave PWM voltage source inverter installed in the servo drive functions to change the frequency to drive the three phase permanent magnetic synchronized AC servo motor. To clarify in a simple way, the whole operation process of the power drive unit is the conversion process from AC to DC, and then to AC again. The rectifier unit for the servo drive comes with a three phase, full-bridge uncontrolled rectifier circuit. Our servo drive has automatic parameter tuning function. The speed controller parameters can be automatically identified via rotational inertia, and then they are optimized based on speed step response. It comes with good flexibility, stability and effectiveness, which greatly shortens system setting and adjusting time. Our servo drives are also equipped with high precision encoders to assure accurate speed and positioning. To illustrate, they use 17-bit incremental or absolute photoelectric encoders as the position feedback unit, so as to achieve precision and fast positioning. AS210 servo drive supports various bus networks, including Profibus, DeviceNet, Modbus, and industrial Ethernet, etc. Also, it has multiple built-in software to offer functions such as inching operation, original point searching, and electronic gear, etc. Other control modes: 1) Position and speed integrated control mode 2) Position and torque integrated control mode 3) Speed and torque integrated control mode Note: The detailed information for above control modes is to be determined during the product development and manufacture process. Protections Under-voltage, over-voltage, over-current, over-heat, over-load, over-speed, position feedback failure, regenerative braking protections, etc. As a specialized servo drive manufacturer in China, we also provide harbor crane 4-quadrant inverter, integrated full serial VVVF control cabinet, serial calling board, VVVF escalator control cabinet, and much more.